Alternate one driving plate and one driven plate until all 16 plates have been installed. Then fit the pressure plate and the shim with its counternut. 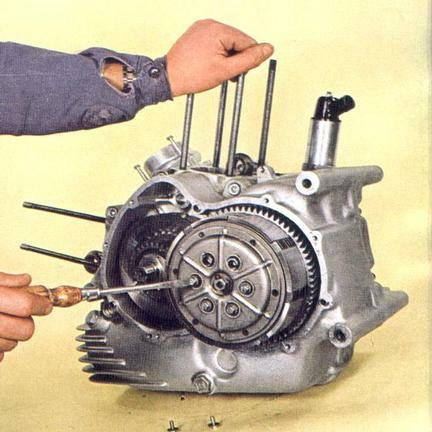 Before fitting the gear selector cover, install the following parts in the transmission shaft hole from the selector cover side: A 5/16 X 5/16 bearing; a 5/16 ball; another 5/16 X 5/16 bearing; and a rod with the ball part toward the clutch lever.